Further enhance your staining experiments with EXPOSE IHC detection systems offering reduced background and greater sensitivity than polymer detection systems. In addition, discover extensive resources to troubleshoot your IHC experiments. A 28 year old man presented with a firm, painless submandibular swelling for 3 months. The swelling was excised, and measured 4.3 x 2.3 cm. 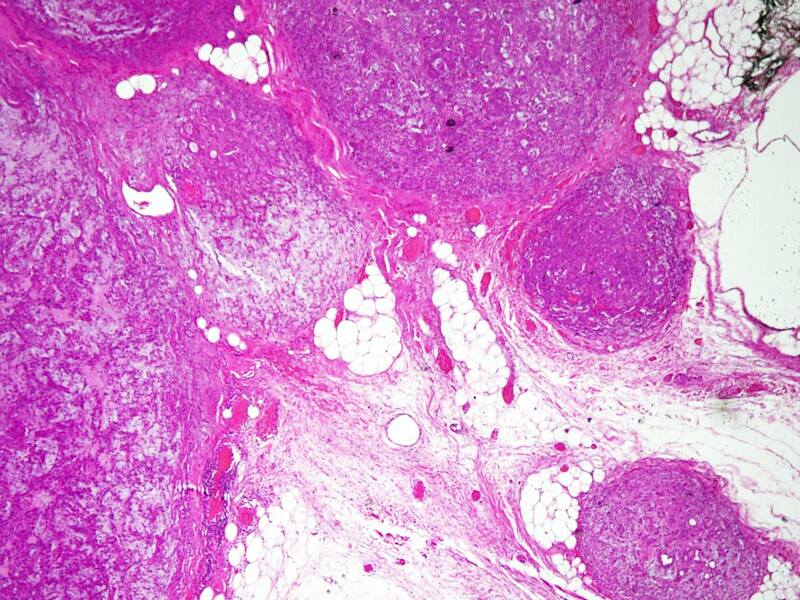 Pleomorphic adenoma (benign mixed tumor) is the most common tumor of salivary glands. It often occurs in women in their 30's, but can present at any age as a painless, slow growing tumor. Most (90%) occur in the parotid gland, with 10% in submandibular gland, and only rare tumors in the sublingual gland. Grossly, they are well demarcated, partially encapsulated, with a gray-white cut surface. 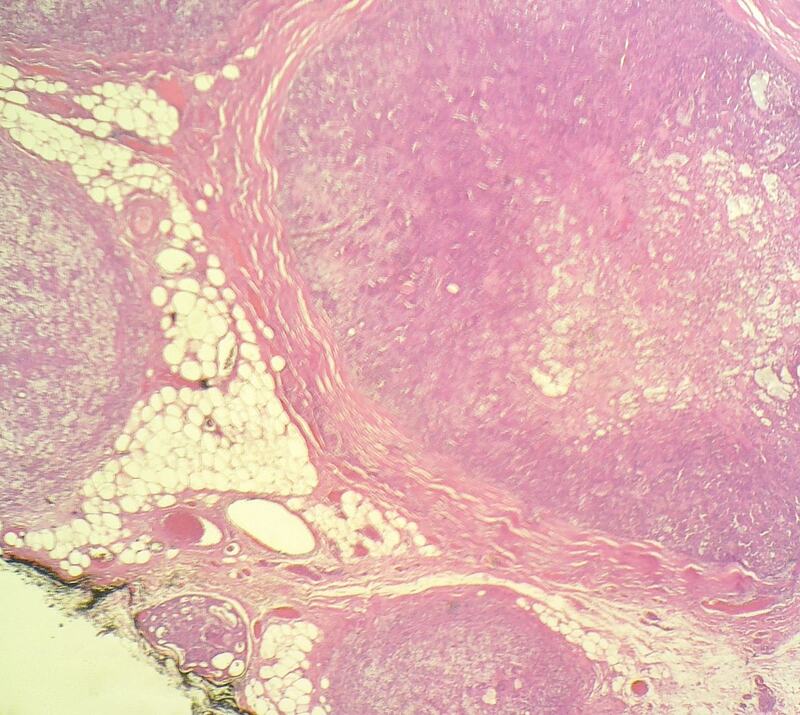 Tumor extension into adjacent tissue may be subtle. Histologically, there are often tongue-like protrusions into the surrounding salivary gland. In this case, satellite nodules were apparent. A thick capsule may be present; in this case, there were focal areas of capsular thinning. 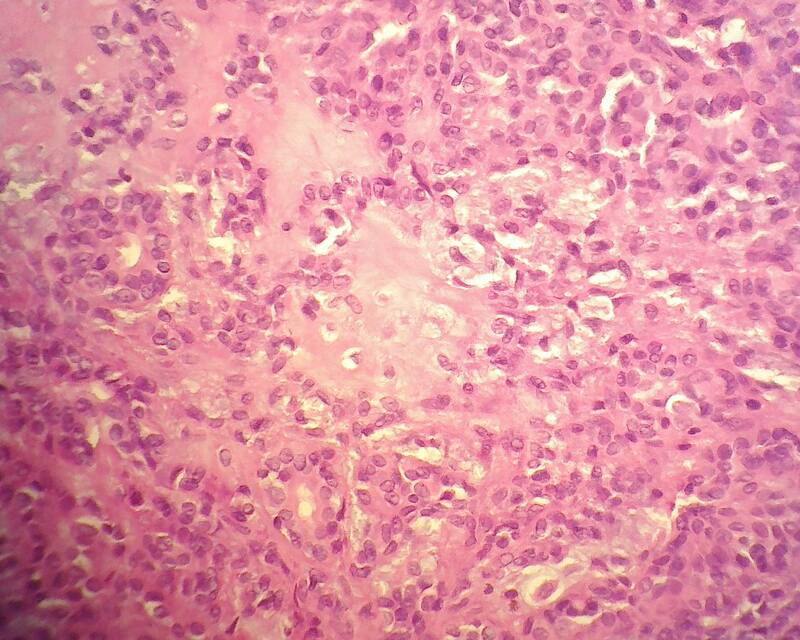 Pleomorphic adenoma is biphasic with epithelial and mesenchymal cells. The epithelial cells are usually glandular and occasionally squamous, spindle or oval, with large hyperchromatic nuclei. 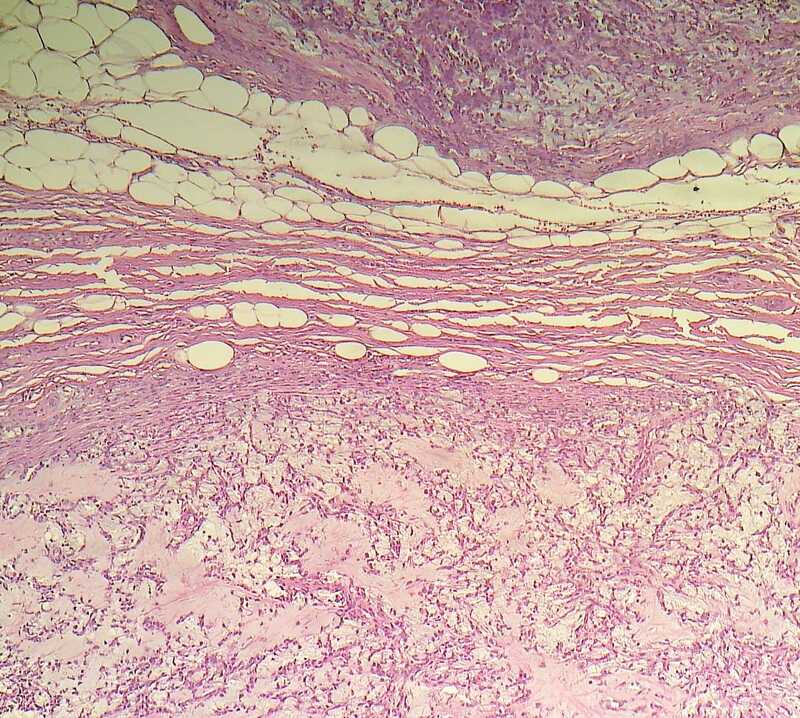 A myoepithelial layer may be present. The stroma is usually myxochondroid or hyaline. Mucin is often present. There is no atypia, no mitotic figures and no necrosis. 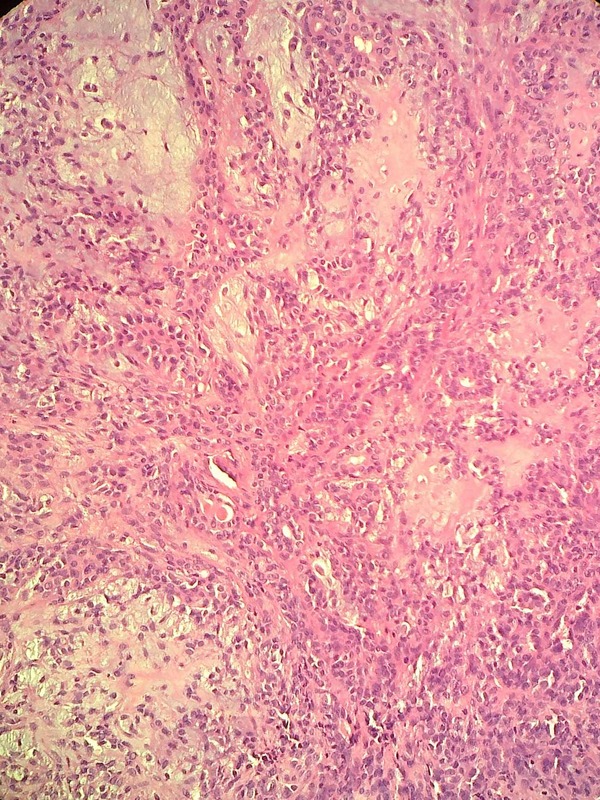 Pleomorphic adenomas of the salivary gland have been considered to be pure epithelial cell tumors arising from myoepithelial or ductal reserve cells that can produce large amounts of matrix substances (Am J Surg Pathol 1984;8:803). The epithelial and mesenchymal cells often arise from the same cell clone (Hum Pathol 2000;31:498). Treatment has traditionally been wide local excision including all of the submandibular gland to avoid recurrent tumors, which are frequently multi-focal and difficult to excise completely (Eur Arch Otorhinolaryngol 2007;264:1447). However, endoscopic resection (Laryngoscope 2010;120:970) and gland preserving surgery (Br J Surg 2008;95:1252) have recently been described. 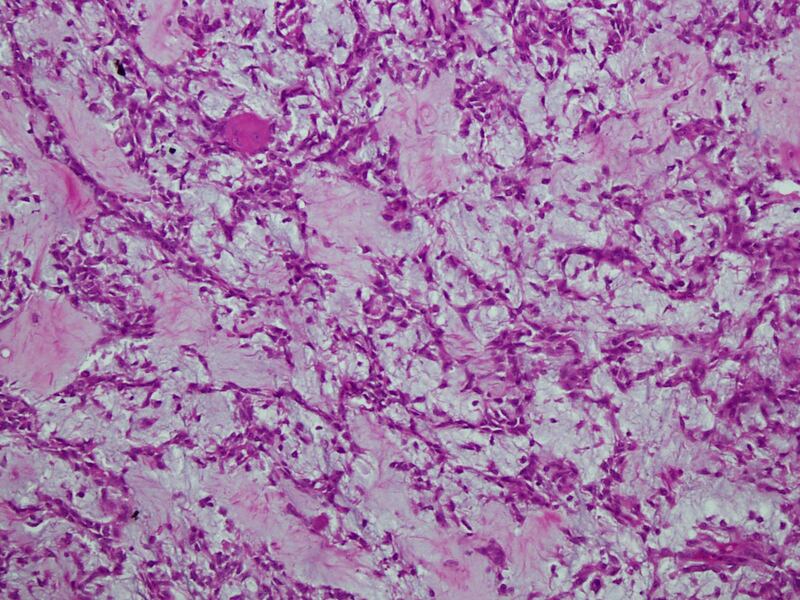 Risk factors for malignant transformation include a submandibular location, older age, larger size, prominent hyalinization and increased mitotic rate.